Are you tired of hearing where we currently are on this cruise? If you are somewhere in the bitter cold, I can see how you’d be cursing me. I hope not, because today, we are in Belize!! Yesterday was Honduras, and today, Belize. It’s like I’m living a dream life this week, y’all. And to think that in just over 5 months, we’ll be traveling just a little farther south to Costa Rica for our honeymoon…le sigh. Life is good. And so is this soup. Chili. Whatever it is. Warm, comforting, and delicious. The night I made this I actually had tortilla soup planned. And then I realized that I had used up all my tomato sauce making deer chili over the weekend. Oops. And running to the store was not an option. So, I began to think of what else I had in the house. Of course I planned and shopped lightly because I knew we’d be leaving for a week and I wanted minimal, if any, waste. Then I remembered that a couple of weeks back I had this salsa verde white chicken chili on the menu, but I never made it. That meant I should have all the ingredients on-hand! And, it was similar to tortilla soup. By similar I mean it has chicken broth and…chicken. And then of course the toppings I decided to add were mostly the same. And friends let me just tell you – this soup, chili, whatever you want to call it was mighty tasty!! Andplusalso…this is a pretty fast soup/chili to prepare. After the chicken is cooked – which takes maybe 8-10 minutes itself – the soup is done in another 10-15 minutes. And it’s amazing. 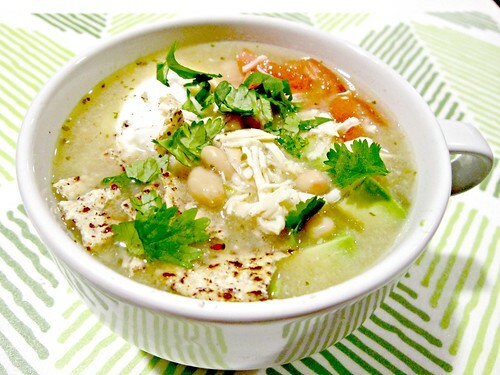 So…while you’re sitting there in freezing (or just really cold) temps, whip this up and warm up your tummy! Heat a large skillet over medium high heat. Add olive oil or spray with cooking spray. 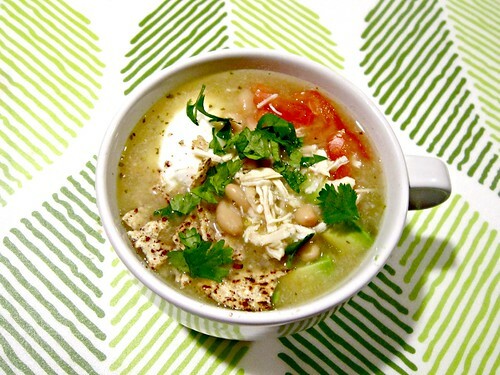 In a large pot, add shredded chicken, chicken broth, beans, salsa verde, cumin and garlic powder. Stir to combine. Bring to a boil over medium-high heat. Cover and reduce heat to medium-low. Simmer for at least 10 minutes. Serve warm with desired toppings. I listed the ones we used above…it was so good! !